Good morning my creative friends & welcome to another "Scrapping the Little Things"! Well, we have had one crazy weekend! Last Thursday I had taken Baby Aaron to the dr & he had a sinus infection :( Then on Friday, I took Anthony to the dr for his regular "well visit" & he also got the flu shot! I had a bad feeling that day because when we first got there, the line was "literally" a mile long! lol.... NO ONE was covering their mouth's while they were coughing AND sneezing :( I just KNEW I was going to get sick, & sure enough, I did :( I didn't feel well on Saturday, but I "manned up" & made the best of it to celebrate Baby Aaron's 14th birthday! While we were at lunch that day, Anthony started feeling sick too :( Let's just say that by Sunday, we ALLLL felt like a truck hit us! We were all miserable & the ONLY person who managed to stay healthy was my hubby! (lucky guy) ;) He was an AWESOME nurse to all 3 of us! That was my weekend in a nutshell! 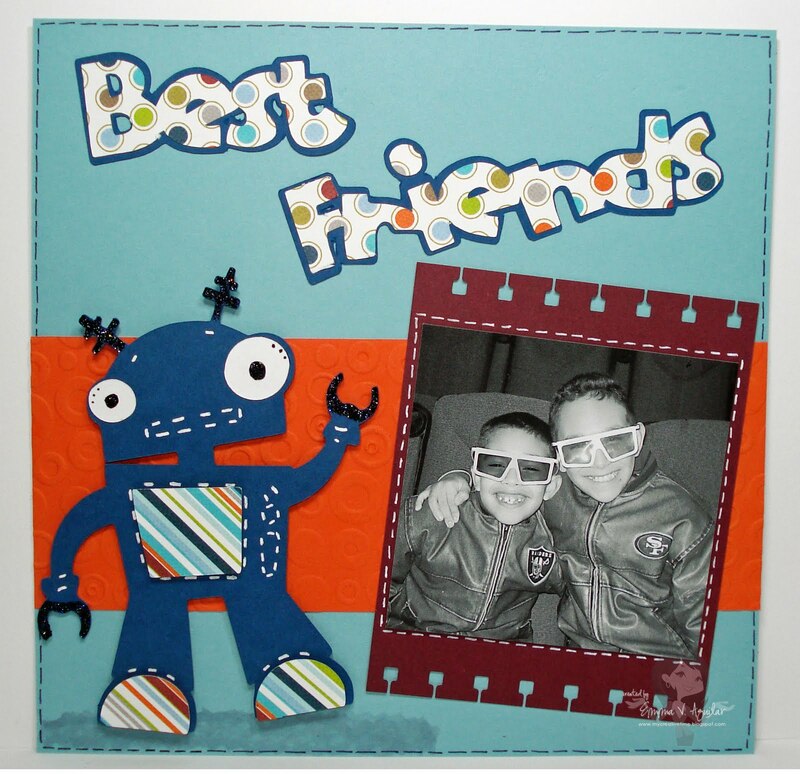 Obviously I had no energy to even walk into my craftroom this weekend so I am posting an "oldie, but a goodie" 8x8 layout I had made in 2010....YEP, 2010!!! ;) You can see the ORIGINAL post HERE! There is even a video on how I created this layout too! Awwww sooo sorry about the ickies at your loving home and yes your sweet hubby was definitely your hero!! Hope all of you are feeling better real soon. I did go check our your robot LO and video. How cute you did a super job as always. It was fun to see you do a Cricut Cartridge project. How many runs did your hubby make to Starbucks? Take good care and God bless!! Hope you are feeling better REALLY soon Emma!!! Awww....so cute! Sure hope the little guys are feeling much better :) An oldie but goodie! Great border with the paper punch! Great layouts...even the older one :D I hope you all are on the road to recovery and are feeling much better. Oh Mrs. Emma, Im sorry to hear about your weekend. I hope you and your family feel better soon. Love the oldie but goodie layout, its simply adorable! DT thanks for all the inspiration, your layouts were so pretty! AW, sorry to hear that you are all sick. It seems like every time school starts, the germs come out and it doesn't help if people don't cover their mouths and noses. I know you can't hide from every germ but YUCK. Well, I hope you are all feeling better. HAPPY BIRTHDAY to Baby Aaron. WOW 14 already :) Time sure does fly by. Hope he had a wonderful birthday. Love that layout Emma, the boys looked so little there and that robot is so cute. Awesome projects! Great oldie but goodie Emma! The layouts are simply adorable! Look how young your babies were! Thanks for all you do! Aww...hope you and your loved ones get better soon! Love your layout and all the design teams projects! !